“No union founded on the principles of liberty and equality could survive half slave, and half free. We made ourselves anew, and vowed to move forward together,” said President Obama in his second inaugural address on Monday, Martin Luther King, Jr. Day. 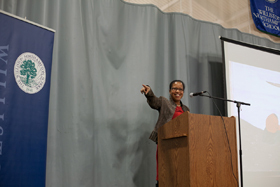 Lamothe introduced her talk entitled, “There are Mountains Beyond Mountains So Put on Your Travelling Shoes,” as a journey through identities she has studied, personal memories of her family’s immigration experience, her academic research on the Harlem Renaissance, and the lyrics of a Montreal-based indie rock band. The daughter of Haitian immigrants, Lamothe grew up surrounded by Haitian food, culture, and religion. When family members and friends from her parent’s village immigrated they all bought houses in such proximity they recreated the community they had left. Lamothe described the Queens of her youth as a melting pot saying, “I thought everyone’s parents or grandparents had accents because everyone came from somewhere else.” One Christmas her mother borrowed a recipe for lasagna from a co-worker, it was the first time non-Haitian food was served in their house. “In this country, people of African descent have always been migrants, border crossers, travelers in search of a home, even when generations have been born in this country,” said Lamothe. Citing Dr. King’s final speech, “I’ve Been to the Mountaintop,” Lamothe said she kept running into, “these mountains and hillsides” while preparing to speak at Williston. “The idea of the mountain-scape as challenge; the long climb until you reach the top where you can finally rest and look back,” said Lamothe was prevalent in Dr. King ‘s rhetoric and also symbolizes the Great Migration-era battle African-Americans fought to create an identity of their own. 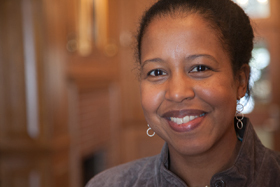 Using the prose of Caryl Phillips, the paintings of Jacob Lawrence, James van der Zee’s photographs, and Bessie Smith’s lyrics, Lamothe introduced the Harlem Renaissance, the most popular class she teaches at Smith. From 1917 until the start of the Great Depression in 1929, the Harlem Renaissance was, “a time of new beginnings and also great social upheaval.” It was a time, not unlike today, when the economy was shifting to industrialized workforces in urban factories, immigrants from northern Europe flooded in by the thousands, and the 19th amendment was passed. What it meant to be American was changing. Then Lamothe asked if anyone knew of a band called Arcade Fire. Hands shot into the air. A Canadian indie rock group, Arcade Fire released a song entitled “Sprawl II (Mountains Beyond Mountains)” on their 2010 album “The Suburbs,” which Lamothe came across. She quoted some of the lyrics, comparing the suburban angst of the twenty-first century with the alienation and disconnect suffered by African-Americans a century earlier. This story made me want to read the entire speech! Could I possibly get a copy? or is it posted somewhere? Hi Paula, Ms. Lamothe’s speech is now available on our “In Their Own Words” blog. This idea of constructing “a meaningful identity” seems so crucial to speak to young people about. I would have found a lot of value in this talk had I heard it when I was a teenager. Thanks for sharing.